Hair: Greying and thinning, straight, worn slicked back. He has a strong widow’s peak. Eyes: Narrow, medium-brown eyes under straight brows. His right eye opening is half the size it should be, the lids scarred and narrowed so that the lashes barely clear the edges of the flesh. The pupil is cloudy with cataracts, but he is able to see light and shadow. Skin: Warm light almond except where scarring has robbed it of all pigment. Facial Features: High cheekbones on a face more round than long. The right side of his face is distorted by massively disfiguring chemical burn scars. His right ear is a twisted nub of flesh, his right eye scarred half-shut. His nose is intact down the bridge, but the right side of the tip is eaten away. His lips are twisted away from his teeth on the right side, drawing his mouth back into a sneer, and giving him a permanent lisp. Other Physical Traits: Compactly built, with narrow hips under a barrel chest. His shoulders, chest, forearms and hands are scarred by the same gas that eroded his face, dappling it with hypopigmented spots that look like white candle wax spattered and hardened over his skin. Has a perpetually dry mouth due to the scarring, which he combats with frequent lozenges. Voice: Slightly nasal, light tenor, with a soft rasp and a severe lisp caused by his burns. 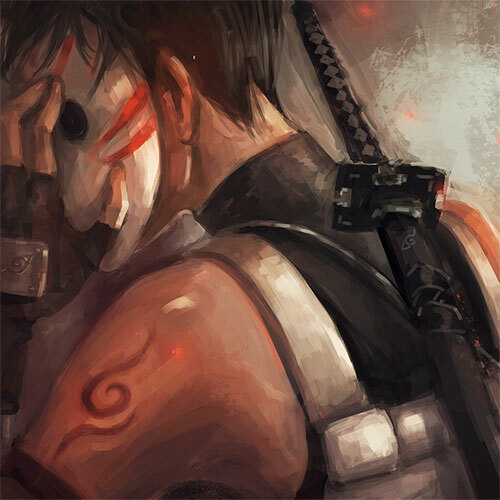 Identifying Marks: ANBU tattoo on left upper arm. Severe burn scars on face, shoulders, arms, and hands. Usual Clothing: T&I grey uniform with sweeping black coat. Jounin blues. Dad clothes when at home: buttoned shirts and khakis. Loafers. Low-fashion jeans and plaid shirts. Fighting Style: Skilled jounin, equally strong with ninjutsu and taijutsu, and a fearsome genjutsu user even before his disfigurement. Is even better with genjutsu now. Chakra Class and Special Jutsu: Wind and Fire affinities. There’s a family legend that the Shibata are descended from tengu, and in generations past could transform into demon-crows. Weaknesses: Blind on the right side, prone to sinus infections because of his damaged nose. Weak right shoulder due to muscle damage from the chemical burns. Service Record: Entered Academy at 6, graduated at 10. Promoted to Chuunin at 13, and Jounin at 16. Tapped for Interrogation at 18, and quickly promoted in T&I’s ranks when it became clear Tomohiro was especially gifted at extracting information and making sense of it. General Personality Traits: Insatiably curious and genuinely interested in other people and what makes them tick. Incredibly patient. Absolutely dedicated to making sure his people and village are taken care of. Well educated, blazingly smart, has fairly sophisticated tastes. Quirks: Really good at Go. Sexual Orientation: Heterosexual, and maybe just a little sadistic. Gifts/Talents: Sharp as a laser. Understands human psychology eerily well and is a freakishly good judge of character. Picks up on weaknesses in others with uncanny accuracy. Can charm or otherwise compel information out of unwilling subjects with what looks like ease. Flaws: Has an internal moral compass that many would call gyroscopic, pointing to true north only when it concerns his family, his people, his village. Religion and Philosophy: Has a solid intellectual grounding in the dominant Shinto/Buddhist blend in Fire Country, but not a believer. Finds religion fascinating, and very revealing about its believers. Fears: Seeing harm come to his family through his own failing. Dreams and Ambitions: Interrogate Orochimaru. Find someone who can consistently beat him at Go. Hero: Ushiwakamaru, folk hero who learned the secret of kenjutsu from the tengu on Mt Hiei. Met his wife, Koemi, when he had to submit several complicated expense reports following an extended mission. Koemi was working in the accounting office at the time as chuunin support staff. It wasn’t love at first sight, but the spark was there, and after a few months of dating, with war on the horizon, they decided to marry. Koemi is the down-to-earth, detail-oriented type. When the war effort ramped up, she was assigned to the QM and Supply office, and spent her time making sure even in times of rationing and dwindling access to resources, the Hokage’s front line troops had everything they needed. Tomohiro was a rising star of an interrogator. His outgoing personality and genuine interest in people combined with a jounin’s ruthlessness made him a natural. Tomohiro and Koemi conceived about a year into their marriage, but Koemi suffered a miscarriage three months into her pregnancy. There followed four years of failed pregnancies, until the day their son Hakone was conceived. The pregnancy was surprisingly easy, after so many losses, and nine months later the Shibata family added a healthy baby boy. Despite many further attempts, they were never able to conceive again: Hakone is an only child. When their son was seven, Tomohiro went on a mission he almost didn’t come back from. It was the height of the Third Great War, and Tomohiro was sent to interrogate a high-value subject at the southern front. Kirigakure, previously known only for their raw bloodthirst and tactical bluntness, deployed a new chemical weapon while Tomohiro was there, pouring a heavier-than-air caustic gas into the trenches. It ate into living skin, dissolved trachea and lungs when it was inhaled, eroded blood vessels so that the ninja exposed it were, for the most part unrecognizable, reduced to bloody ooze clinging to bone. Tomohiro was one of the lucky ones who made it out of the trench before the damage was fatal. When he emerged from weeks in a hospital bed and yards of bandages, he didn’t look anything like the Daddy Hakone had said goodbye to months earlier. Half of Tomohiro’s face was replaced with a grotesque amalgam of scars that twisted his mouth into a permanent, tooth-exposing leer, and softened his voice into a chalky lisp. But under the scars, in that ruined voice, he said the same things he always had. He was the same man. A loving father and husband. And Konoha’s most fearsome interrogator. As the war ground on, and after, he continued to rise in skill and responsibility, ultimately becoming the head of T&I.